The designo manufaktur name should sound familiar. 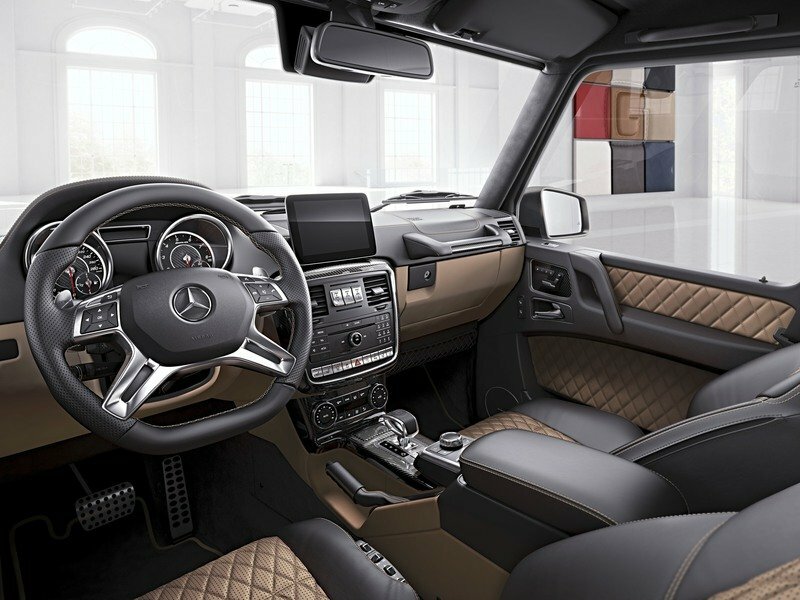 Mercedes launched this special edition range back in 2015 in an effort to add exclusivity and a level of customization to the G-Class. Available on the G350 d and the G500, the DM edition comes with black exterior trim pieces designed to complement the three paint colors. These colors include designo magma red, designo mystic white, and obsidian black. The black accents continue onto the 19-inch, five-spoke wheels, side mirror caps, spare tire cover, and the grille. The wheels are wrapped in street-biased 275/55R19 tires. Also included with the designo edition are the Sport and packages. They bring stainless steel running boards, velour floor mats, chrome-plated seat adjustment switches and speaker grills, and the sports exhaust system. Available on the G350 d and the G500, the DM edition comes with black exterior trim pieces designed to complement the three paint colors. These colors include designo magma red, designo mystic white, and obsidian black. The black accents continue inside the Designo G-Wagen. Black, perforated Nappa leather holds all five occupants in place, while red contrast stitching holds the seats together. Red accents are also found on the seat belts, dash stitching, and on the AMG Performance flat-bottom steering wheel. Piano black trim on the center console contrasts the chrome “designo manufaktur Edition” plaque just ahead of the gear shifter. 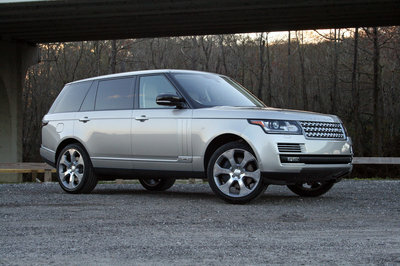 In addition to the bespoke appearance of the cabin, the special edition makes a few creature comforts standard. These include the Seat Comfort package, the leather dash, illuminated doorsills, and a black microfiber headliner. As mentioned, the designo manufaktur Edition is available on two models of the G-Class lineup. The G350d designo manufaktur Edition carries a starting price of €109,878.65. Currently, that equates to $119,807. Opting for the G500 version pushes the price to €121,683.45, or $132,673 at current exchange rates. For those with a bigger bank account, the Exclusive Edition brings some tasteful changes to the G-Class, but only on the high-end Mercedes-AMG G63 and G65 models. Visually, the Exclusive Edition’s most telling feature is its matt paint finish from AMG called monza gray magno. The color covers nearly everything on the exterior, including the bumpers and spare tire cover. What isn’t gray is black. 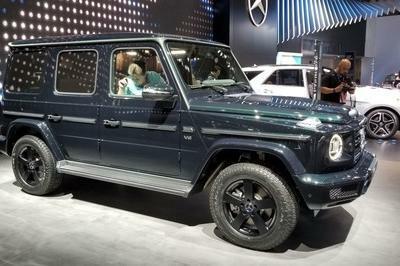 This includes the black trim along the G-Wagen’s sides and the matte black stripe along the doors. The 21-inch, five-spoke AMG light alloy wheels are, of course, black, and are wrapped in wide 295/40-series performance tires. Despite the darker finishes on the Exclusive Edition, Mercedes still found a way to incorporate chrome. The running boards, side exhaust, front skid plate, bumper crowns, and grille are all shimmering with the bright stuff. Inside, the Exclusive Edition is more luxury oriented than the designo manufaktur Edition. Six color combinations are offered on the two-tone interior. Alternately, the quilted leather on the AMG sport seats can be configured in three colors with the side bolsters remaining black. A leather-covered dash, steering wheel, center armrest, door panels, and shifter finish off the look. Two trim packages are offered: AMG Carbon (pictured) or piano black. For those wanting a bit more flavor, the seatbelts can be ordered in red, the overhead grab handles covered in leather, and a two-tone theme to the AMG Performance steering wheel that matches the seat colors. Visually, the Exclusive Edition’s most telling feature is its matt paint finish from AMG called monza gray magno. As for the price, the G63 Exclusive Edition starts at €163,125.20. That translates to $178,287 at current exchange rates. Moving up to the G65 Exclusive Edition costs even more. Its price starts at €287,658.70 – a whopping $314,379! That’s pretty darn expensive for a body-on-frame SUV whose underpinnings are three decades old. 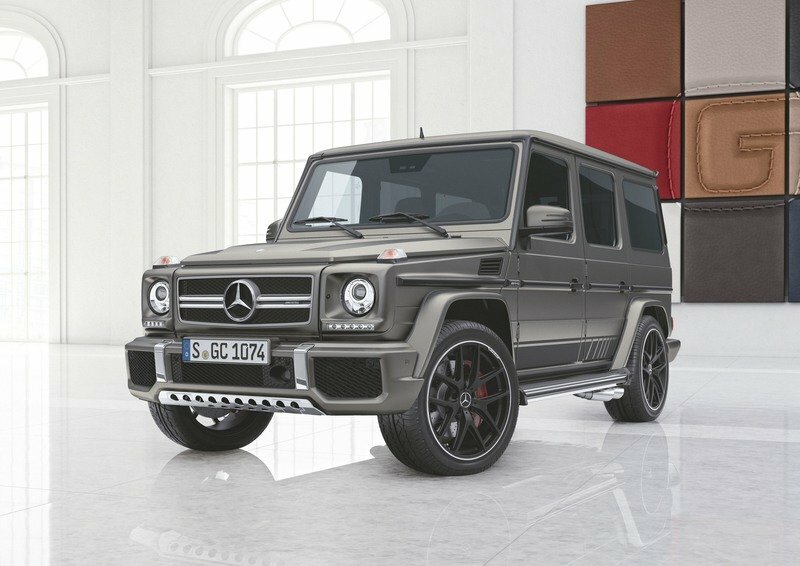 Then again, the G65 comes powered with a twin-turbo 6.0-liter V-12 that makes 621 horsepower and a stump-pulling 738 pound-feet of torque. The spring to 60 mph is said to take only 5.3 seconds. The G63 isn’t’ a slouch, either. 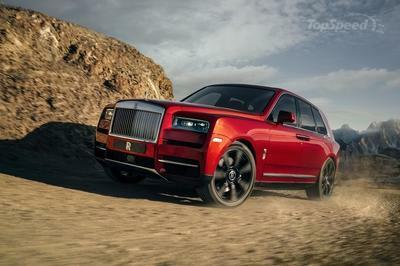 It’s powered by a twin-turbo 5.5-liter V-8 making 563 horsepower and 561 pound-feet of torque. Somehow, Mercedes says the G63 only loses a tenth on its way to 60 mph, getting there in 5.4 seconds. The G-Wagen also comes standard with three locking differentials to accompany its full-time 4WD system. Despite its relatively low ground clearance and road-biased tires, the G-Wagen is a beast off-road. Not that 99.99 percent of owners would dream of driving on anything worse than wet grass at the kiddo’s soccer game. Fashions come and go, the legendary G‑Class continues: Since 1979 the indestructible off-roader from Mercedes-Benz has been a permanent fixture in the model range, and continues to be extremely popular with fans around the world. 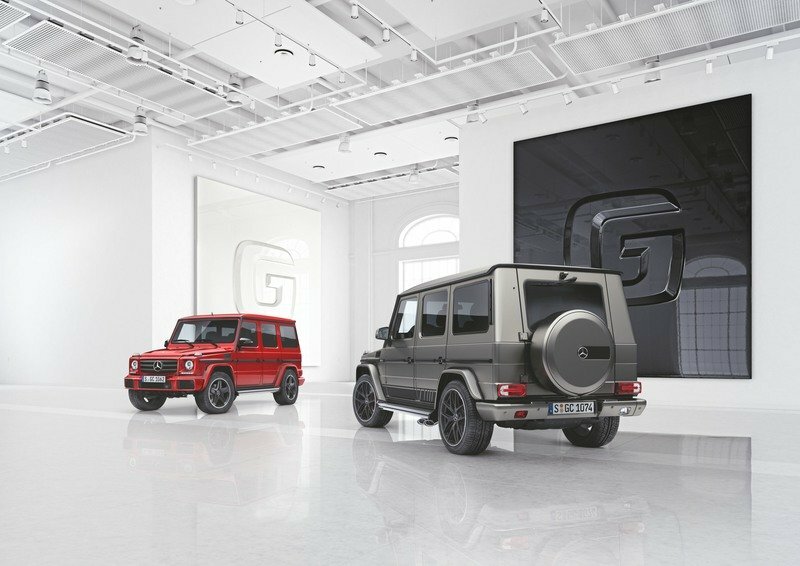 Customers who wish to upgrade their G‑Class with even more individuality, style and luxurious appointments will find the perfect package in two new special models: with a choice of the designo manufaktur Edition and the Exclusive Edition. 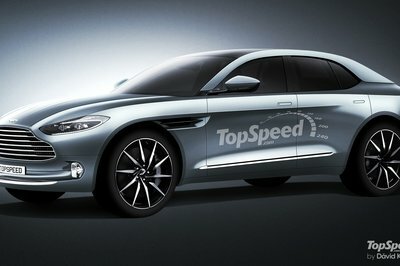 The sales start date is 2nd May 2017, with the market launch starting in September. In addition, the digital services of Mercedes me connect further enhance comfort in the G-Class. The "designo manufaktur" range available since the end of 2015 has been outstandingly received by G‑Class customers. This individualisation range stands for tailor-made appointments, traditional workmanship and the highest quality. The new "designo manufaktur" Edition is available for the Mercedes‑Benz G 350 d and G 500 (combined fuel consumption: 12.3-9.9 l/100 km; combined CO2 emissions: 289-261 g/km). An assortment of particularly high-quality appointments makes these G‑Class models particularly eye-catching: the numerous exterior features in black go extremely well with the three available paint finishes in designo magma red, designo mystic white and obsidian black. The AMG 5‑spoke light-alloy wheels with 275/55 R 19 tyres are likewise in black, as are the inserts in the side rub strips. 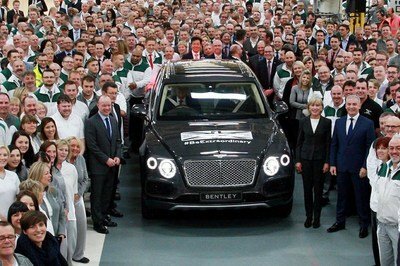 The three louvres of the radiator grille, the exterior mirrors and the spare wheel cover are also in obsidian black to round off the design. The designo manufaktur Edition has a price advantage of around 24 percent compared to a comparably equipped standard model. 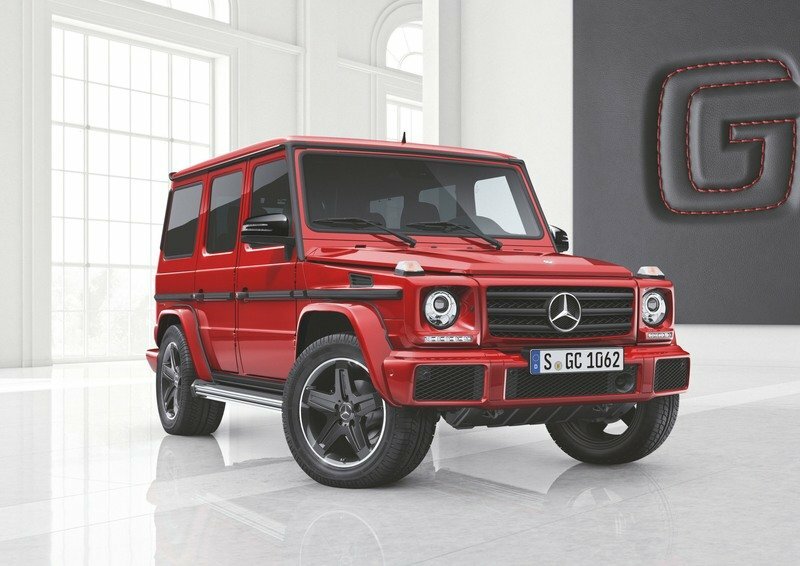 The two top models from Mercedes-AMG, the G 63 and the G 65 (combined fuel consumption: 17.0-13.8 l/100 km; combined CO2 emissions: 397-322 g/km), are now available as the particularly high-quality Exclusive Edition. They have a particularly dynamic visual appearance thanks to a model-specific underguard of stainless steel, AMG sport strips on the sides, rub strip inserts in a dark aluminium look and the spare wheel cover painted in the vehicle colour. This is complemented by striking AMG light-alloy wheels with size 295/40 R 21 tyres: the G 63 is shod with 5‑twin-spoke light-alloy wheels painted in matt black with high-sheen spokes. The G 65 features ceramically polished light-alloy wheels in a 5‑twin-spoke design. 53.3 cm (21‑inch) 5‑twin-spoke light-alloy wheels in black with high-sheen rim flanges and side rub strips with inserts in carbon-fibre look are available for both models. Apart from the other paint finishes in the sampler, the matt paint finish AMG monza grey magno is exclusively available as a highlight for the Exclusive Edition. This special model also has a high-quality interior design: standard appointments include the designo Exclusive package with a two-tone, leather-lined dashboard and AMG sport seats with two-tone leather upholstery. There is a choice of two-tone designo nappa leather in six attractive colours, or as an alternative two-tone seats in designo nappa leather in three colours with seat side bolsters in black carbon leather. In both variants the seat and door centre panels are in a diamond pattern. Customers have a choice of AMG Carbon or black designo piano lacquer trim. The Seat Comfort package including multicontour seats and seat climatisation for the driver and front passenger are also on board the Exclusive Edition. Other options available from the designo manufaktur range include designo seat belts in red, leather-clad grab handles in the roof liner and a two-tone AMG Performance steering wheel matching the seat colours. Under the name "Mercedes me connect", Mercedes-Benz now also offers an extensive package of free standard services and Remote Online services for the G‑Class. The range of services is being expanded continuously. They are based on an integrated onboard communication module. The free standard services include automatic emergency call (eCall), Accident Recovery, Breakdown Management and the particularly convenient customer service Mercedes me assist. Customers are able to find a Mercedes-Benz service partner online. Mobile services and apps take care of arranging appointments, for example. The functions of Mercedes me assist also include video hints covering the functions and vehicle operation, as well as recommended engine oils and tyres.